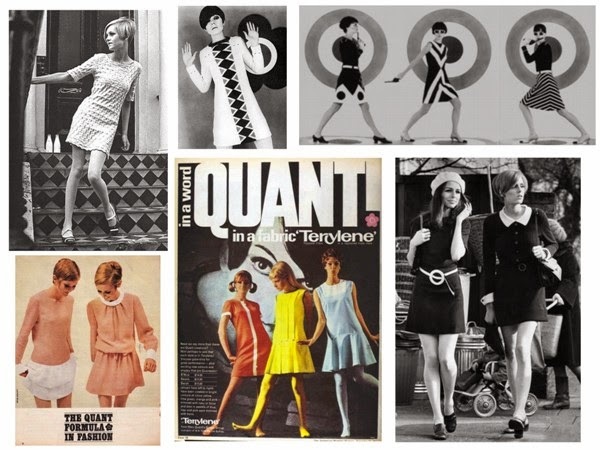 Upon one of my many internet searching sessions, I have recently become acquainted with the wonderful Mary Quant (not literally, we're not actually friends *yet*). This revolutionary designer is the woman we have to thank for the infamous miniskirt (and hotpants). She was a key player in the '60s mod and youth movements in fashion and is quite an icon. At the time, the miniskirt was a symbol of youth. It was daring yet innocent, and its' controversial reputation meant young people HAD to wear it. Unfortunately, nowadays the miniskirt rep has completely changed. Now, if your skirt is super short it's seen as a sign of bad taste, maybe even sleezy. It's sad how the once young yet classy trend has become controversial in a very different way. I don't think it's the case for all miniskirts, and it's sort of the norm for most hem lines but the expectations have changed a lot. However, the innocent, '60s shift dresses have become my latest obsession. Expert tip: they work best with winged liner. What do you think about the miniskirt? Sweet or bad taste? I'm so into mod at the moment. Mary Quant is just so great. I'm currently loving a-lines skirt and pointy bow flats. Great post! Same! Ah nice sounds like a fab combo. Thank you! It's weird how the interpretation of clothing changes so much with time. Like how blue jeans were the ultimate sign of rebellion in 50s/60s and now they're sloppy or lazy or whatever. I know it's so interesting. Yes! Me too! That sounds adorable. Thank you!